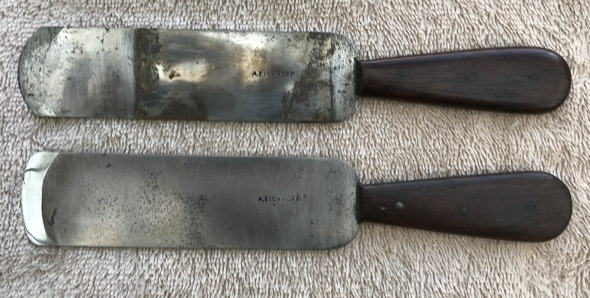 A pair of August Eickhoff french style paring knives, made in New York, 19th century. A side benefit of my regrinding and knife sharpening service is that I get to see some interesting antique knives. These August Eickhoff knives are beautifully made, have a wonderful balance, a lovely patina, and given the amount of distal taper (both on the blade and the tang) must have been forged. Eickhoff also made round knives (aka. head knives) for leatherworkers which occasionally show up for sale today. In the late 19th century, Eickhoff was located at 381 Broome St, NYC, making scissors, woodworking tools, and resharpening knives. He served on the NY Board of Education, and advertised his wares in a Teachers College Educational Monograph. It may be time to make a few reproduction Eickhoff knives. 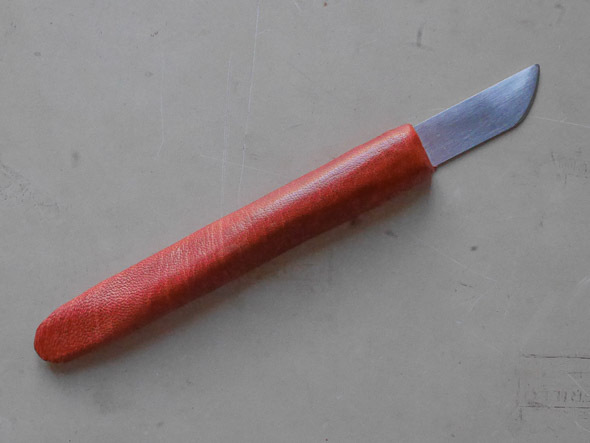 This knife can be used for all types of paring necessary in bookbinding: edge paring, reducing spine and caps, paring deep into a skin (similar to a spokeshave’s action) and even for overall scraping, if you are into that. M2 Hybrid Knife. Around 8 – 9 inches long, and 1 inch wide. 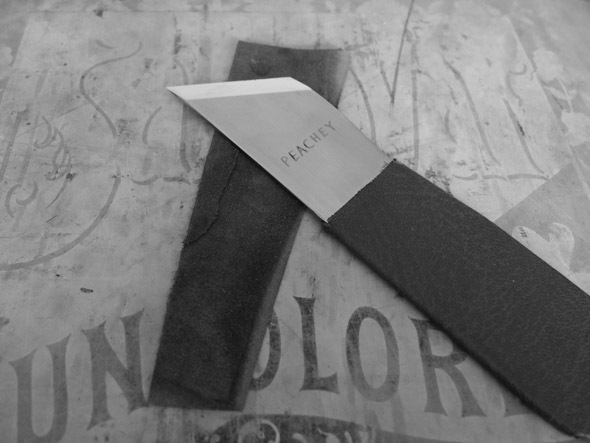 Since the grind marks on the primary bevel go along the length of the blade, the primary bevel is not apparent when looking at the top of the knife. The exact curve of the cutting edge varies a bit from knife to knife. Cross section of primary and secondary bevels. 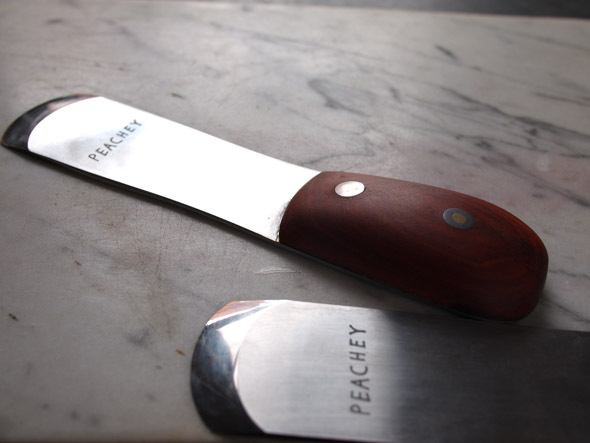 The slightly curved blade creates more opportunity to find a sharp area as the knife dulls, so it can be used longer. Straight blades, as they become dull, don’t seem to bite the leather enough to get started with a cut. The disadvantage is you can’t just rub it back and forth like a standard straight edged knife when resharpening. Stropping takes a slight twist of the wrist, to keep parts of the cutting edge in contact with the strop throughout the stroke. The rounded areas allow you to work into a skin, for headcaps and the spine. But the shape also allows you to use it like a standard English style knife for edge paring. The third change is that the tip and heel of the cutting edge are rounded. This prevents the knife from cutting through the skin when you are working away from the edge, similar to how a spokeshave blade works. In practice, I don’t miss having a pointed, sharp tip. A rounded tip also makes it less likely to dig into your paring surface. 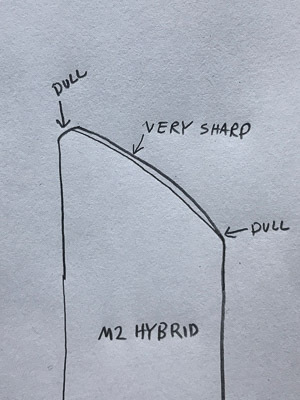 The M2 Hybrid used like a standard English knife for edge paring. All of these aspects combine to make a sensitive and versatile knife intended for professionals. An analogy for cyclists might be this is more like a track bike than a road bike. This knife, in addition to edge paring, can do most of what a spokeshave can do, albeit with more “workmanship of risk”. If you want the most versatile knife on the market, look no further. 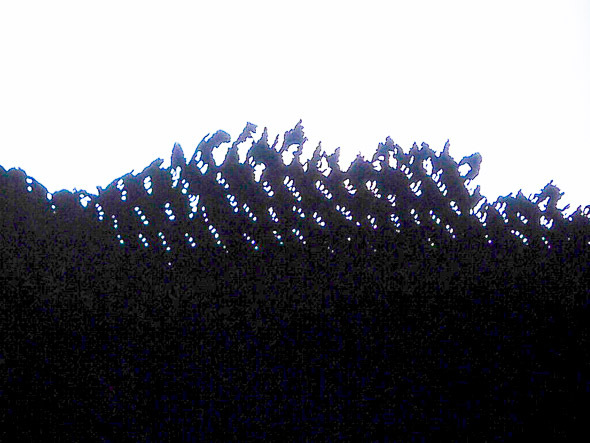 Close up of a piece of goatskin feather pared,, so that the valleys of the grain are cut through. The middle of the blade was used for this, almost parallel to the edge of the leather..
Progressively paring towards the center. 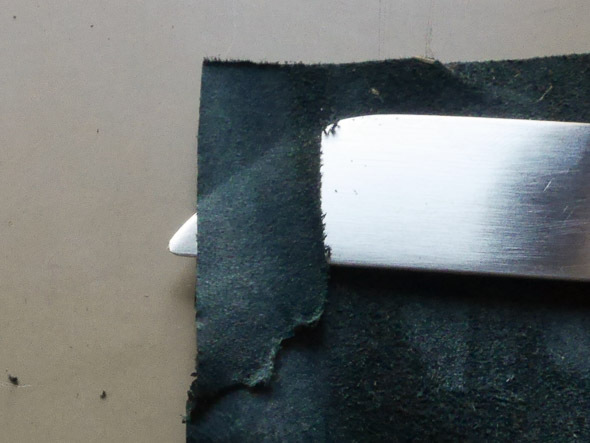 The rounded edges keep the blade from cutting through the leather as it stretches. M2 Hybrid Paring knife. M2 Steel. The handle is hand carved wood, covered with vegetable tanned goatskin, and ergonomically shaped. The metal is .040″ thick, the handle around 5/8″ at the thickest point. It is about 1 inch wide and around 8-9″ in overall length. The secondary bevel is 13 degrees. Hand sharpened to .1 micron. The M2 Hybrid Paring Knife. $250.00. Order here. Small M2 Hybrid knife. The best knife for onlays and intricate leather decorations. Also great for paring paper. M2 Steel. The metal is .025″ thick, about 5/8″ wide and 6-7″ long. Leather covered wood handle. The secondary bevel is 13 degrees. Hand sharpened to .1 micron. The Small M2 Hybrid Paring Knife. $150.00. Order here. Small M2 Hybrid knife bottom left, regular size next to it. Many bookbinders, when getting into leather binding, are surprised by the wide variety of leather paring knives and machines. In bookbinding terminology there are four basic styles of knives and they are named for the nations that generally use them: English, French, German and Swiss. Other leather crafts use different terminologies. In addition to paring knives, many binders use paring tools and machines. 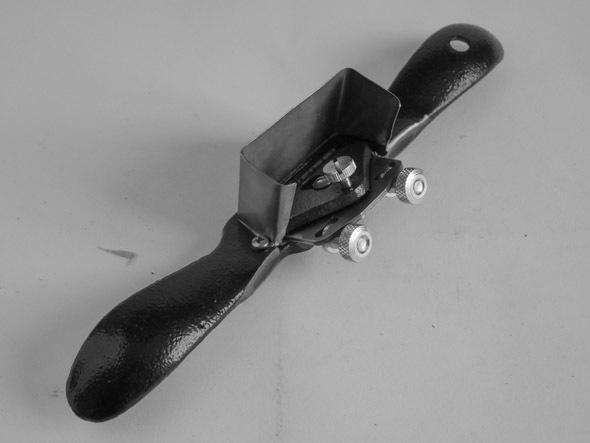 Most commonly a modified 151 style spokeshave, a double edge razor blade paring machine, or more rarely a razor blade plane. If you have a lot of work, skins can be sent out to be split. A few also thin leather by sanding or grinding. Below are my observations on the advantages and disadvantages of all of these. In North America, most binders use an English Style knife for edge paring, followed by a spokeshave for making a long, gradual bevels. This type of beveling is used for English style fine bindings and rebacking. The knife making firm G. Barnsley made the most common knives used by English bookbinders in the 20th century. French style knives are very popular with fine binders, many of whom were French trained. One defining stylistic feature is a center mounted wood handle, however. The handle on the French knives has always puzzled me, since you tend to hold it more on the blade and rest your palm on the handle. 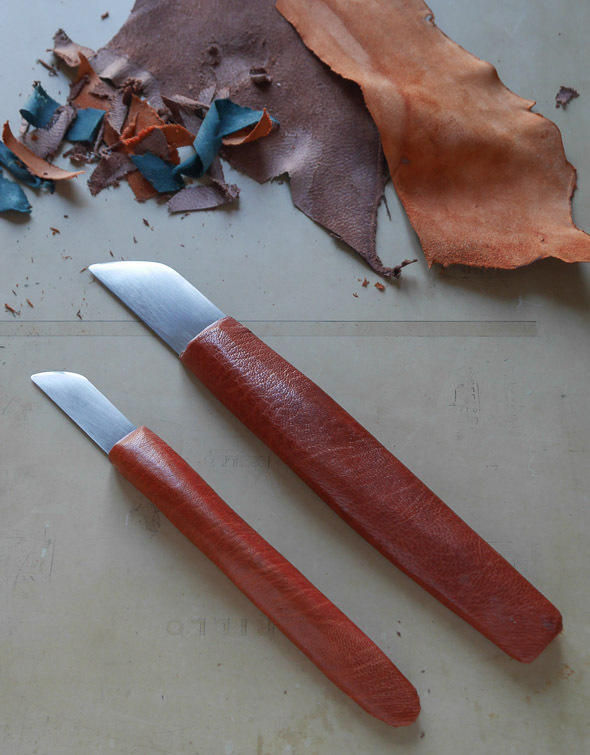 The handle protrudes onto the leather, limiting the angle the knife can be held. To get lower paring angle, I was the first to introduce the top mounted wood handle. Joseph Zaehnsdorf. The Art of Bookbinding. 2nd. ed. (London: George Bell and Sons, 1890), 91. I’ve only used these a couple of times, so don’t really have an opinion. I did have a German trained student who used it expertly. The one I have is slightly flexible. In Zaehnsdorf’s 1890 The Art of Bookbinding, the German paring knife looks like a regular chef’s knife. Even the modern versions have a wedge shaped taper, so that the back is fairly thick and the opposite edge is sharp. Did the modern German style knife morph from a regular chef’s knife? A modified 151 style spokeshave is a powerful and effective tool for making long, gradual bevels in leather; ideal for rebacking or an English style full leather binding. It can also be used to bevel binders board. It is a lot of fun to use. These were originally intended for woodworkers, and I think binders started to modify these for leather starting in the 1920’s. Here is some of my research, and a tentative type study of 151 style spokeshaves. 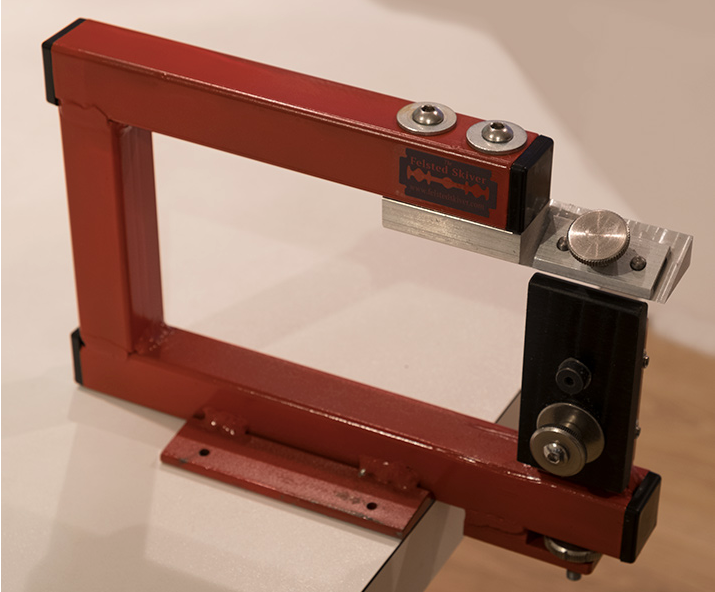 Razor blade paring machines, including the Scharffix, Brockman and the new “Felsted Skiver” all use a very similar arrangement: a double edge razor blade suspended above an anvil or roller. These are very useful for thinning small or large areas flat. Razor blade machines excel at paring leather very thin. 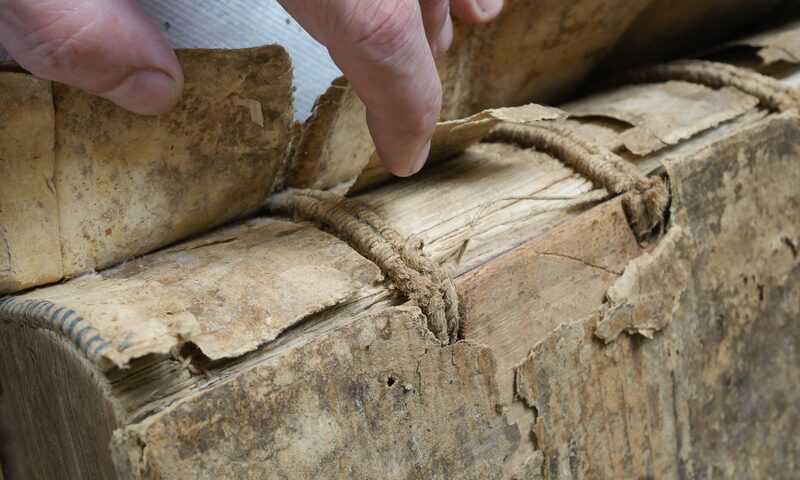 Common bookbinding applications include millimeter bindings, spines and corners for half bindings, and most commonly leather labels. A spokeshave is sometimes used to clean up ridges created from overlapping cuts on larger pieces. My favorite paring machine is the original style Brockman, which is not available new anymore. One advantage of his design is a curved bed for for the razor blade, which gives it significant rigidity and positions it to cut into the the leather straight on, rather than at an angle. Older hand held double edge razor blade handles also bend the blade like this. Brockman told me he made the first 100 of them himself, which are painted blue, and the later black ones were manufactured for him. A third green cast version was briefly produced in the 2000s (? ), which looked very nice, but I haven’t tried it. There are rigidity problems with many Scharffix machines, so make sure to test them out before purchase. I’m looking forward to trying out the newest machine, the Felsted Skiver. Malcolm Raggett designed and is selling these. He has tested a variety of commercially available double edge razor blades, which is very useful research, and confirmed the Feather as one of the best blades.. But as I mentioned, I haven’t tried them out yet. I wrote a brief history of them, then added some tips on their use, and later recorded my failed attempt to make a better version. I ended up tearing a lot of leather, and went back to using a 151 modified spokeshave and razor blade paring machine. One skin can be as expensive as any of these tools. This used to be common for french design binders, who even indicated what thickness the leather should be at various areas, through use of a template. I’ve heard these specialists are disappearing, though. 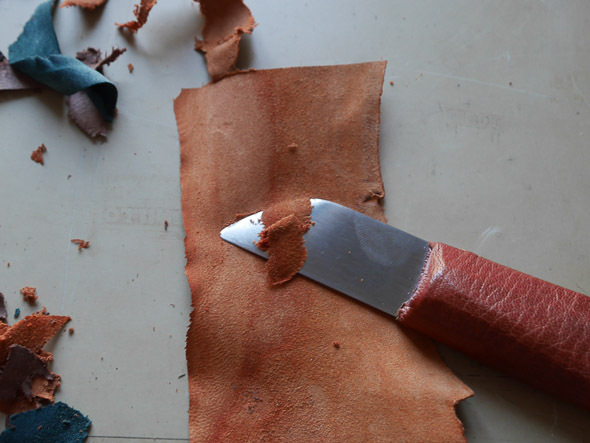 We do have leather manufactures who will split a skin (or more likely a dozen) down to a certain thickness. This is an excellent option if you are an edition binder. If the skin is thick enough you can get both sides back. The machine that does this is like a toothless horozontal bandsaw. I’ve used Hohenforst Splitting Company and they did an excellent job on a difficult leather: undyed and unfinished calfskin. I wouldn’t recommend either of these methods unless there are extraordinary circumstances. Not only do these methods produce a lot of hazardous dust, they are very slow and, at least in my experience, grinding is very uncontrollable. I have done this if the leather is exceptionally weak, or need to level chatter that has resulted from an improperly tuned spokeshave. In this case choose a very coarse sandpaper, around 80 US grit. Sanding an entire piece of leather for rebacking or covering is very tedious. After saying all of this, I think any knife made from good steel, properly hardened, that is hand sharpened, can work. I did some testing of tool steels and a summary is posted here. But I do think it is easiest to start with a hand sharpened knife, like the ones I sell in my store, in order to feel what sharp is, then learn to maintain this by stropping and eventually by resharpening.Happy paring!